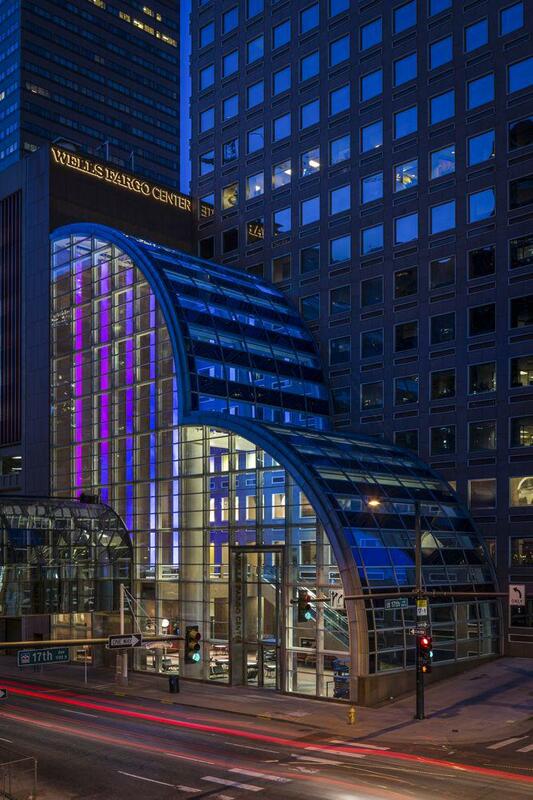 Denver’s Wells Fargo Center designed by Philip Johnson in the 1980s gets a 21st-century makeover. My fourth-grade teacher showed us a futuristic movie in which people were no longer able to go outside. As a consolation, giant movie screens acted as windows on the inaccessible world, allowing you to change seasons and vistas with the click of a remote, summoning fall foliage, crashing waves, fields of flowers, or mountains covered in pristine snow. Maybe that’s why I am both delighted and spooked every time I encounter a project that brings a virtual representation of the outside indoors—like the wall of hyper-realistic clouds at the Amsterdam airport; an interactive installation of cherry blossoms blooming in a historic building in downtown Washington; or the eight-story digital waterfall, 86-foot-tall trees, and flock of flying birds that have given the lobby of Denver’s third tallest skyscraper a new lease on life. 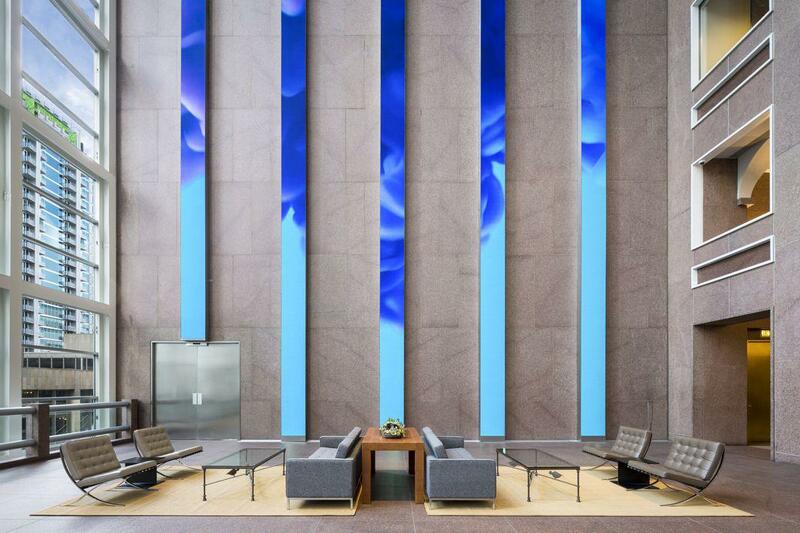 ESI Design transformed the glass atrium lobby of the Wells Fargo Center, designed by legendary architect Philip Johnson in 1983. 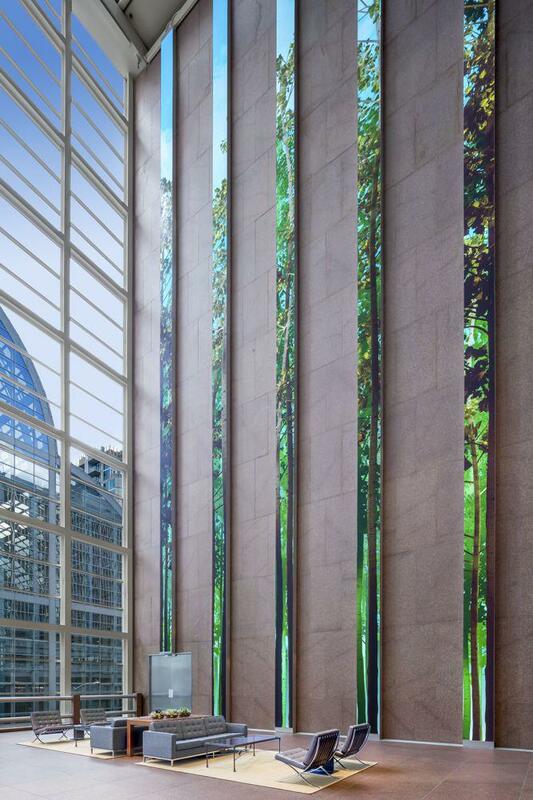 By installing five 86-foot-tall floor-to-ceiling LED columns that are six times the resolution of normal HD, it was able to create a dynamic display of the area’s natural wonders in the formerly somber lobby. The flock of 3,600 flying birds are animated in real time thanks to an algorithm ensuring that their flight pattern never repeats. 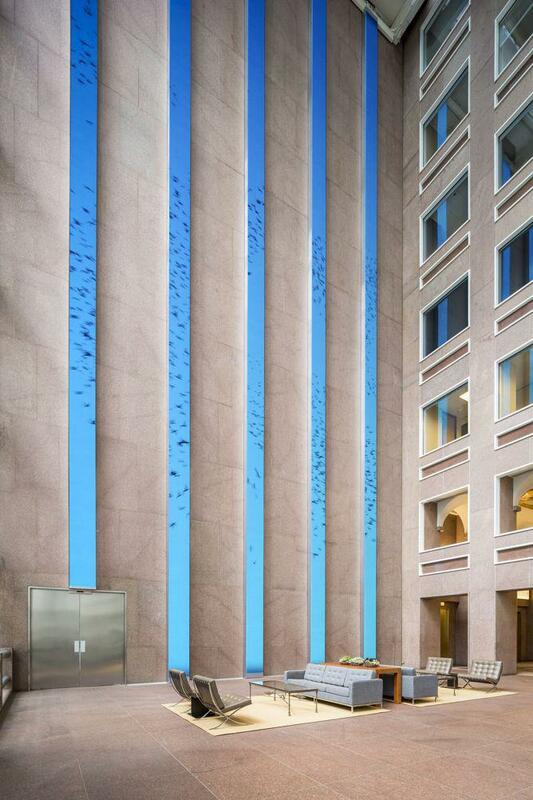 The 3-D cascading waterfall changes speed and volume according to the wind outside. Trees change with the time or day and the season, turning color in the autumn and losing leaves in winter. 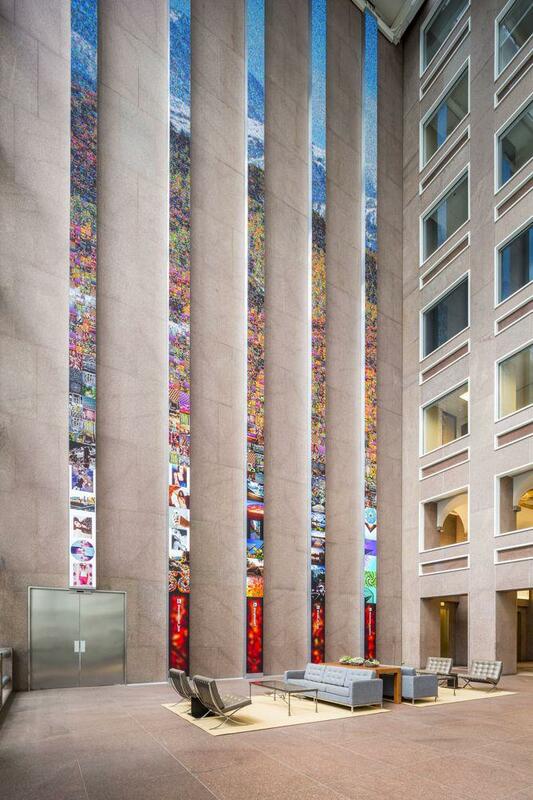 A library of local, user-generated Instagram photos creates a mosaic of Colorado mountains. The installation is visible from outside the building.